TUSCALOOSA, Ala. (AP) — Alabama has brushed off two ranked division rivals without allowing a point. On Saturday, the top-ranked Crimson Tide defense faces an entirely different challenge: The Citadel (4-5) and its triple option offense. All that preparation for Southeastern Conference offenses, including Mississippi State and No. 10 LSU, provides scant help in this one for ‘Bama (10-0, No. 1 CFP). “This is a totally different challenge in terms of how you have to try to defend it and what you have to do,” Alabama coach Nick Saban said. Of course, it’s still the nation’s top-ranked team facing an FCS opponent even with the potential distraction of upcoming games against rival Auburn and, in the Southeastern Conference championship game, No. 5 Georgia. The big question facing Alabama is how much Heisman Trophy candidate quarterback Tua Tagovailoa will play on a right knee that has been bothering him. Saban bristles at any suggestion that he’d sit out Tagovailoa or another banged up starter based on assumptions about the opponent. His approach has worked to the tune of 80 consecutive wins over unranked teams. Defensively, Alabama faces Citadel quarterback Brandon Rainey, who has run for 405 yards in the past two games, his only starts. The Bulldogs are averaging 291.9 rushing yards with 28 touchdowns on the ground. Alabama ranks seventh nationally in defending the run, giving up 96.3 yards a game. 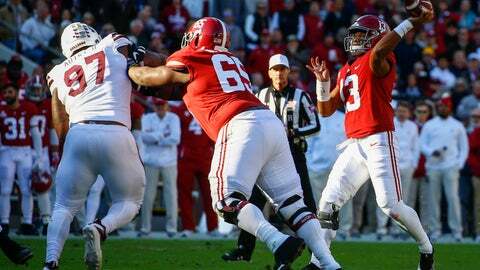 The truth is, Alabama would almost certainly hope to limit the playing time for Tagovailoa, who was sacked four times against Mississippi State and sat out the fourth quarter. The question is, can backup Jalen Hurts play after missing the past two games with an ankle injury. Third-teamer Mac Jones could get significant time on the field if the game goes as expected. Alabama is coming off shutout wins over Mississippi State and LSU — by a total of 53-0 — and hasn’t allowed a point in nine-plus quarters. Alabama could break the school record of 24 consecutive wins at home. The Tide matched the record set from 1971-74 last week against Mississippi State. The Citadel has dominated the second half in its past two games, outscoring Samford and Western Carolina 63-3 and producing eight rushing touchdowns. Saban has made sure his players know about the 2011 game with Georgia Southern, which lost 45-21 but produced a whopping 302 rushing yards against Alabama’s defense.